1. Sad Navy news. 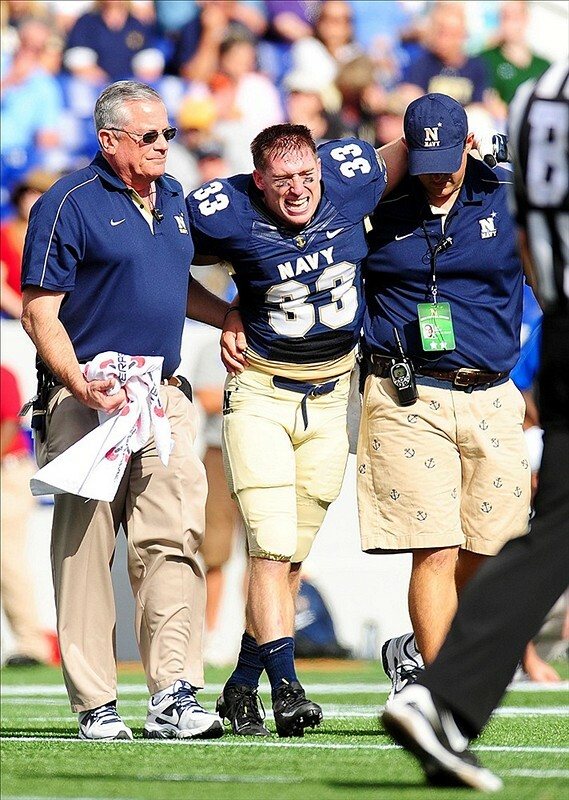 Navy slotback John Howell’s football career likely ended Saturday. The senior suffered a right knee injury in the first quarter against San Jose State and was helped off the field; he watched Monday’s workout from the sidelines on crutches, according to this Washington Times report, and Navy head coach Ken Niumatalolo said Howell wouldn’t play again this season. Howell racked up more than 500 yards rushing at Navy, including 60 this season on just six carries. Expect junior Darius Staten and senior Bo Snelson to see more time at slotback alongside senior Gee Gee Greene. 3. Speaking of QBs … Could Air Force senior signal-caller Connor Dietz have a breakout performance this weekend? David Ramsey at The (Colorado Springs, Colo.) Gazette points out Navy’s defense has seen an option attack in practice for ages and could be well-suited to stop Cody Getz’s 170-yards-a-game rushing rampage. His solution? That four-letter word most service academies dare not speak: Pass. 4. Blackout, Part I. Air Force is asking its fans to wear black at Falcon Stadium on Saturday. Get details on the “BLACK OUT” here, including where to purchase special black T-shirts the day of the game. 5. Blackout, Part II. The Falcons will be wearing black, too — alternate uniforms the school says are based on the B-2 and F-22 designs. They’ve released only a snippet so far (that’s it on the left). As soon as we see more, we’ll show you (anybody out there in Colorado Springs want to tweet us a picture, feel free). 6. Punter pride. Navy sophomore Pablo Beltran averaged 49.2 yards over five punts on Saturday, helping Navy stay competitive in a 12-0 loss. It was enough to earn special teams player of the week honors among Football Bowl Subdivision independent schools. 7. Wetzel’s wizdom. A starter at outside linebacker for a Division I school. Leads his team in sacks (three) and tackles for loss (four). Studies systems engineering. Carries a 3.89 grade-point average. And the cherry on top — a perfect 1600 on his SATs. Not a bad resume, and it might be enough for Navy senior Keegan Wetzel to claim one of the National Football Foundation’s 16 Scholar-Athlete Awards, which includes an $18,000 postgraduate scholarship. He’s one of 50 nominess, according to this Navy release. The winners will be announced later this month and will also be semifinalists for the William V. Campbell Trophy, which comes with an additional $7,000 in education grants. Army’s Andrew Rodriguez won the award last year; Navy’s John Dowd was a finalist.